A smartphone displays the Uber app, which allows users to hail private-hire cars, on June 2, 2014, in London, England. Peter Faris, an independent driver who works with Uber, stands in front of one of his vehicles on Feb. 14, 201,3 in Washington, D.C. Earlier this month, investors poured $1.2 billion into Uber, a tech company whose smartphone app connects taxi drivers to passengers. The share of the business these investors received suggests that Uber is worth $17 billion, a mind-boggling sum for a young company with only a few hundred million dollars in revenue. That said, Uber isn’t the only highly valued tech company these days, with others like Airbnb and Dropbox each valued at about $10 billion by investors. For all these companies, the key selling point is “disruption,” one of the tech industry’s worst buzzwords. The companies argue that they’re upending existing ways of doing business — hailing a taxi, with Uber, or finding lodging, with Airbnb — and given the sizes of the businesses they’re supposedly disrupting, the sky’s the limit when it comes their value. But is Uber, which was founded five years ago, really worth $17 billion? My answer, as I hope to detail below, is only if we make some big assumptions about the taxi market and Uber’s place in it. The value of any business, no matter what it does and where it is in its life cycle, is based on its capacity to generate real cash flows. For young firms like Uber, the expected cash flows are in the distant future, and estimating them will require making big assumptions about how the market and the competition will evolve. To value Uber, we first need to understand how Uber makes money. It does not own taxis or hire drivers; rather, its role is one of a matchmaker.1 Its value comes from its screening of drivers and cars (to ensure both safety and comfort), its pricing and payment system (customers choose the level of service, i.e. taxi, black car or SUV, are quoted a fare and pay via the app) and its convenience (customers can track, on their phones, the car that’s picking them up). Customers pay Uber, and Uber takes 20 percent of the fare, while the rest goes to the drivers.2 Uber’s growth potential rests not only on being able to claim a larger share of the car-service market but also on expanding this market by attracting those who use public transportation or drive their own cars. As a private company, Uber is not obligated to share its financial information with the public, though leaks of revenue figures and gross receipts have played nicely into its narrative of growth. A leaked document in December, for example, suggested that the company generated gross receipts (the fares paid by customers for rides) of $1.1 billion in 2013, which would translate into revenues of $220 million. If we buy into the assertion made by Travis Kalanick, Uber’s founder and CEO, that the company’s revenues are doubling every six months, updated values for both gross receipts and revenues should be higher. In estimating Uber’s value, I’m going to assume $1.5 billion and $300 million as my base year’s gross receipts and revenues. (There are whispers that even these numbers are too low, but as we will see below, the effect on value of using a higher starting number is less than you might think). One way to value a company is to estimate the present value of its future cash flows. How you estimate Uber’s future cash flows depends, mostly, on three things: the size of its potential market, the size of Uber’s share in that market, and what percentage of gross receipts Uber takes. The assumptions you make on each question can dramatically affect Uber’s valuation, so let me walk through mine. For my base case valuation, I’m going to assume that the primary market Uber is targeting is the global taxi and car-service market. I know that there is talk (some from Uber’s management and analysts) that Uber could extend its reach into other businesses such as car rentals, moving services and even driverless cars, but I don’t see evidence that it has succeeded in making any breakthroughs yet. The global market for taxis and car services may be a big one, but it’s very splintered, with lots of small, local operators dominating each city. In many cities, it’s also a cash business, so there’s no easy way to track the total revenues generated by operators. But, there is some data we can build on. For instance, there seems to be a consensus that the most lucrative cab market in the world is in Japan, where yearly revenues are estimated to be about $20 billion to $25 billion just in Tokyo, followed by the United Kingdom with revenues of $14 billion, the bulk from London, and the U.S. with $11 billion overall and about $3 billion in New York. Assuming taxi revenues in the rest of the world add another $50 billion to this total, I arrive at a total market of $100 billion. It’s true that many cities, especially in Asia and Latin America, are underserved and that the global taxi and car-service market will continue to grow well above 2 percent to 3 percent per year — a rate that we’ve observed in the U.S., Japan and the U.K. It’s also true that services like Uber will contribute to that faster growth. I estimate an expected growth rate of 6 percent per year for the next decade, increasing the overall market to $183 billion in 2024. Estimating Uber’s market share is a bit trickier. The taxi and limo market is regulated in most cities. In other words, local governments restrict new companies from entering the market and in return, they regulate the prices that cabs can charge their customers. While Uber has only a minuscule slice of the overall revenues today, the market share it can aspire to gain will depend on at least three factors: drivers’ and passengers’ openness to a different way of doing business, the competition and regulation. The good news for Uber is that the market is splintered; there are no large and established players and very few publicly traded companies in this space. The bad news is that the market will be tough to dominate. Unlike technology companies in other businesses, like Google, Facebook and eBay, the network effect and winner-take-all benefits are limited. Having a global network of tens of thousands of cabs doesn’t make a difference to a customer looking for a cab in New York City. That, along with the regulatory restrictions protecting the status quo and the competition Uber faces from Lyft, Hailo and others, lead me to estimate a market share of 10 percent. Increased competition has already forced Uber to cut its take of gross receipts in some cities. My instincts tell me that Uber’s slice will decrease over time, but I’m going to make the optimistic assumption that the company will find a way to differentiate itself and continue to claim 20 percent of gross receipts. You can see the end results of these assumptions and explore the data in this Excel file, but the narrative is a simple one. Uber not only becomes the largest and most profitable player in the car-service business, it also plays a role in expanding that business. It retains a strong competitive edge, allowing it to generate much higher profit margins than the competition, while becoming a safer investment over time. 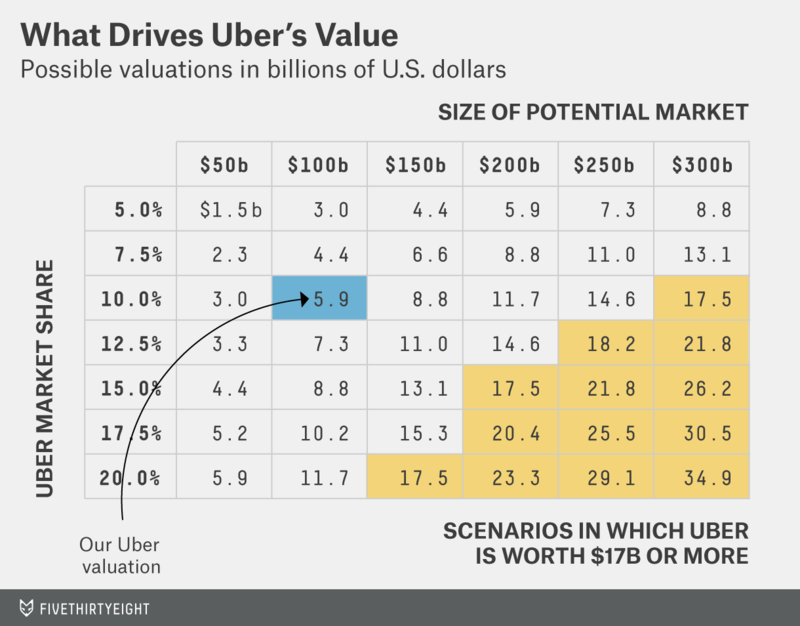 I estimate Uber’s risk-adjusted value to be $5.9 billion. In the table below, you can see how changes in my assumptions about total market size and Uber’s market share, while holding everything else constant, affect the valuation. Let’s allow for a potential market larger than $100 billion and Uber’s market share to be more than 10 percent. 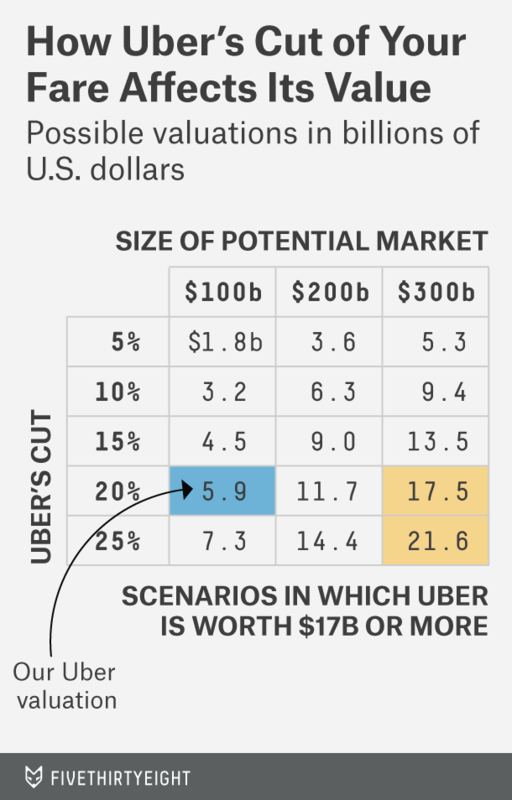 As you can see, the market would have to be three times my estimate — about $300 billion — or Uber’s market share would have to be more than double my base case estimate — more than 20 percent — to justify a $17 billion valuation. The former may hold if you see Uber’s market more expansively than I do, and the latter may come to fruition if you believe Uber will have an easier time overcoming the competition and the regulatory constraints on its growth. I also examined how the value would change if Uber’s slice of gross receipts were to drop from my base case estimate of 20 percent, again allowing for different potential market sizes. Not only does this table point to devastating effects on its value should competition force Uber to cut its 20 percent take, but it also reveals a danger for Uber (and its investors) in focusing too much on growth in gross receipts. Uber may be able to expand its market by charging less, but the effect on value of doing so will be negative. This framework lends itself easily to other narratives. For instance, one of the more optimistic takes says that Uber is in the logistics market, i.e. it’s a player in any business that involves moving people or things from one point to another. That would lead you to define Uber’s market more broadly and come up with a much higher valuation. As you consider these possibilities, though, it’s worth keeping in mind that investing is not a game of possibilities but one of probabilities. The list of Uber’s investors includes some of the biggest names in venture capital, and you may be tempted to conclude that given their pedigree, they must know something we don’t. You may be right, but I wouldn’t be that quick to conclude that smart investors always make smart investment judgments. CORRECTION (June 19, 10:23 a.m.): An earlier version of the second table in this article misstated the valuation of Uber given a potential market of $100 billion and Uber’s cut of 10 percent. It would be $3.2 billion, not $5.9 billion. This article was adapted from a June 9 post on Musing on Markets, the author’s blog. Uber has a low-cost model that should theoretically allow it to keep a large percentage of its revenues as profits. Its expenses include employee salaries, marketing and customer acquisition costs and technology investments. Uber has reduced its take in some cities where it faces competition from other companies such as Lyft and Hailo. Lacking specific information about expenses and profits at Uber, I will draw on the information I have on technology companies more generally, especially fast-growing ones in the social media and online space. I’ll assume that Uber’s pre-tax operating margin will be 40 percent, well above the median value of 20 percent for technology companies. When revenues are the only operating numbers with substance, your reinvestment must be tied to them. In particular, you need to estimate how many dollars of incremental revenues each incremental dollar of investment creates (a ratio of sales to capital). There’s very little that we’ll learn from Uber’s past on this measure, but again, drawing on the cross-sectional distribution of this measure for all technology companies, I’ll use a sales-to-capital ratio of 5.0 (much higher than the median value of 2.5 for technology companies). Lacking any information on the proportion of Uber’s revenues that are from outside the U.S., I will assume that the company’s initial tax rate will be 30 percent (close to the U.S. corporate average) and climb over time to hit 40 percent in 10 years. It’s inarguable that there’s a lot more operating uncertainty in investing in Uber at this stage in its life cycle than there is in investing in the median public company. I will assume that the cost of capital demanded by investors for the first five years will be 12 percent (at the 90th percentile of U.S. public companies) but that it will gradually decrease to the cost of capital of a median public company (8 percent).